In the interest of Energy Conservation it is obviously an advisable first step to seal off any openings in the building envelope. Caulking of windows and doors as well as sealing the home from attic and garage spaces is always a good idea. 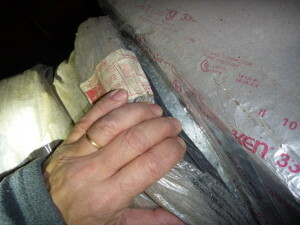 An often overlooked area of concern is ductwork which runs through unconditioned space such as an attic or crawlsapce. Sealing the leaks which can develop over time from failing taped connections is more important than one might realize. Return leaks are problematic because they allow exterior air to enter the system. Air flowing through return ducts to the air handler is typically 80 degrees with 55% humidity. In contrast, exterior air introduced to the system via return leaks in the attic can reach 130 degrees and 80% humidity. Consequently, air entering the air handler is hotter and moister than the system was designed to process. This results in hotter air exiting the air handler and longer running time to satisfy the thermostat. This, in turn, raises operating costs, wastes energy, and shortens the life of the equipment. Return leaks greater than 10% are considered excessive. Supply leaks are also problematic because they allow cold, dry, conditioned air to escape into unconditioned space, typically the attic. This is inefficient and causes the conditioned space to be under negative pressure. Negative pressure causes unconditioned air to be drawn into the conditioned space from the exterior. This can result in high levels of moisture and microbial growth inside the home. Further, supply leaks in the attic cause condensation on adjacent surfaces. This condensation can run down the boots and onto the ceiling, resulting in staining of the ceiling and, in extreme cases, microbial growth. Supply leaks greater than 10% are considered excessive.